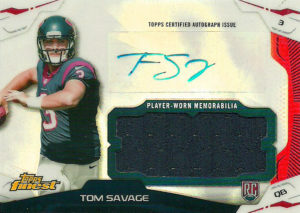 Tom Savage is a fierce competitor and a good study. He started one season at Rutgers (2009) and put up solid numbers as a Freshman with 149 of 285 passing for 2211 yards and 14 TDs in 12 contests. He then lost the starting job after he busted up his hand in 2010 so Tom opted to transfer to Arizona and sat out a year. In the meantime the school fired its coach, so Tom transferred again- this time to Pitt where he was able to get one final year of eligibility in 2013. Savage posted 238 of 389 passing for 2958 yards and 21 touchdowns to only 9 interceptions. Scouts were intrigued. They felt that Savage was a nice sleeper for the right team. He has the right tools, build, a cannon for an arm, good football acumen, and is willing to just do whatever it takes. Tom was projected to go in the 5th or 6th round of the 2014 Draft, and with a run on quarterbacks the Texans decided to pull the trigger selecting Savage in the 4th round. Pundits felt that Tom was the right fit, and Bill O’Brien the quarterback whisperer got his project to work on. 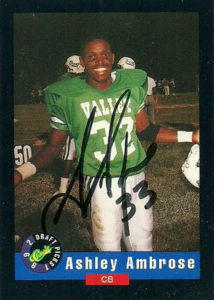 He threw 19 passes his rookie year for 127 yards and an interception. The Texans in the meantime continued to look at their quarterback options. 2015 went by and Tom didn’t throw a pass. It’d be in 2016 things got- well a bit crazy. The Texans decided to make a splash in free agency. Feeling that they were just a legitimate quarterback away from making that happen, Houston signed Denver backup signal caller Brock Osweiler to man the fort. Friction quickly grew between Bill O’Brien and Brock to the point the coach benched the erratic quarterback midway through a game against the Jaguars. Tom came in and lit a fire under the Texans guiding them to a win. For a second there fans thought that Savage was the answer at quarterback, but Tom would be concussed during a game against the Titans the following week ending his season. During the offseason of 2017, Houston got rid of Osweiler while the Texans attempted to wait out the Cowboys for Tono Romo. Unable to make it happen the Texans named Savage the starter and then traded up and selected Clemson QB Deshaun Watson. Savage lasted all of 3 quarters into his first game against the new and improved Jaguars. It was really rough for Tom, but he was ever the team player. He’d return to the starting lineup again, after Watson tore his ACL, but suffer a vicious concussion against the 49ers ending his season. Highlights of his season included leading the Texans to a 31-21 win over the Cardinals on 22 of 32 passing for 230 yards and 2 TDs in Week 11, and in Week 13, when Tom threw for a career high 365 yards in a loss to the Titans. His final season numbers were 1412 yards on 125 of 223 passing and 5 TDs to 6 interceptions. Moving into 2018 it really wasn’t known how the Texans would proceed further with the Tom Savage experience. It’s a shame really. I really like Tom and I still believe he can still ball in the league given the right situation. During the free agency period he signed with the New Orleans Saints where he lost a battle with Teddy Bridgewater to be Drew Brees backup. He spent about a month on the roster of the 49ers, and as of the end of 2018 is a member of the Cincinnati Bengals. Rutgers is not exactly known as a football factory in college circles, so when a guy like Mohamed Sanu gets selected, you have to cheer for the underdog. 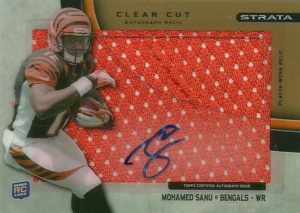 Other people didn’t feel that way, as somebody called up Mohamed on draft day and pranked him into thinking that he’d been taken in the first round by the Bengals. Things worked out though as Cincinnati selected Mohamed in the 3rd round of the draft instead. Mohamed had an amazing run as a Junior playing for the Scarlet Knights, posting 115 receptions for 1206 yards and 7 TDs. In his 3 years at Rutgers, Sanu had 210 receptions for 2263 yards and 12 TDs. He also saw a decent amount of time rushing the ball, recording 125 attempts for 653 yards and 9 TDs. He’d play for the Bengals from 2012 to 2015. Mohamed’s best season came in 2014 when he caught 56 receptions for 790 yards and 5 TDs- including a 76 yard bomb. Somehow he got lost in the rotation in his final year in Cinci. He’d sign as a free agent with Atlanta in 2016. He’d start 15 games and catch 59 balls for 653 yards and 4 TDs. During the playoffs he’d post 11 receptions for 121 yards and 2 TDs helping the Falcons reach the Super Bowl. He’s a sneaky pick up late in drafts that pretty much everybody is aware of now. In 2017, Sanu caught 67 passes for 703 yards and 5 TDs, and in 2018 is on pace to near or eclipse those number by the close of the season. So Ashley’s autograph has come a long way since 1992 or 1993, when it more or less represented a signature, at least compared to what I got through the mail in 2018. Since his time as the defensive backs coach for the Golden Bears of Cal, Ashley has been quite busy. He worked as an intern for the Saints in 2013, and followed that up with one year stints with the Idaho Vandals (2014) and Texas State (2015) as their cornerbacks coach. From 2016 to 2017, he coached for the Broncos of Boise State, and currently is at Colorado as their defensive backs coach- a capacity he held with the Buffs way back in 2010. Ashley gets no respect. The venerable cornerman finished with 42 career interceptions, which is quite respectable in this day and age of football. He had some great cards over the years. 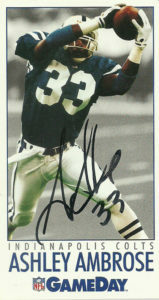 After I got his autograph on his Star Pics cards, I had always wanted to get back around to him and get his Action Packed Rookies card signed- really as a set need, however his GameDay card really takes the cake in this spectacular action shot. It’s well framed and the action barely breaks the image plane at the top of the card. Ashley’s TTM trail had grown cold. I noticed a few attempts through colleges he had previously coached with, so I made sure I had his current whereabouts in mind before I sent this out.